“By the pricking of my thumbs, / Something wicked this way comes” is from Act 4, scene 1, lines 40-41 of the Bard's Macbeth. A year ago at Cambridge House when asked whether the economy was going to rebound I responded, "That light at the end of the tunnel is just the next train. Get out of the way!" Another commentator on stage, who helped manage about $10B at the time, responded that things would get better and not to worry. What happened? Lehman Brothers, AIG, Fannie Mae, Freddie Mac, Bank of America, Merrill Lynch, Citigroup, the Adjusted Monetary Base exploded from $800B to $1,800B as the Federal Reserve fails with quantitate easing, unemployment began to soar and the DOW crashed from 12,000 to 6,500 or 13.95 gold ounces to 7. The prehistoric media wails about how no-one saw this crisis coming. Yet they are still praising Obama's economic policies, heralding an economic recovery and living in denial. Why believe them? Why even read their newspapers or turn to their channels? Many people, coincidentally almost all of the Austrian school of economics, saw this financial and economic crisis coming. There is another massive crash coming. For those people who do not see this coming crash the issue is not one of subjective or objective opinions. The issue is a personality block where the individual cannot handle the truth. If you see neither were we are nor where we are headed then you have a personality block and need professional therapy. Price is what you pay but value is what you get. During the Great Credit Contraction capital is seeking not only the safest assets but also the most liquid. Market liquidity is a business, economics or investment term that refers to an asset's ability to be easily converted through an act of buying or selling without causing a significant movement in the price and with minimum loss of value. Famed value investor Warren Buffett managed to see his net worth fluctuate from $62B to $37B over the past year. His paper profit from bailing out Goldman Sachs has already earned about $2B. In assessing risk, a beta purist will disdain examining what a company produces, what its competitors are doing, or how much borrowed money the business employs. He may even prefer not to know the company's name. What he treasures is the price history of its stock. In contrast, we'll happily forgo knowing the price history and instead will seek whatever information will further our understanding of the company's business. After we buy a stock, consequently, we would not be disturbed if markets closed for a year or two. We don't need a daily quote on our 100% position in See's or H. H. Brown to validate our well-being. Why, then, should we need a quote on our 7% interest in Coke? At the end of the day, a buyer and a seller agree on a price. Prices in the public markets are always set at the margins. When the transaction is not consensual, such as with robbery, there is no price and such transactions are unsustainable because they are immoral and will eventually always fail. 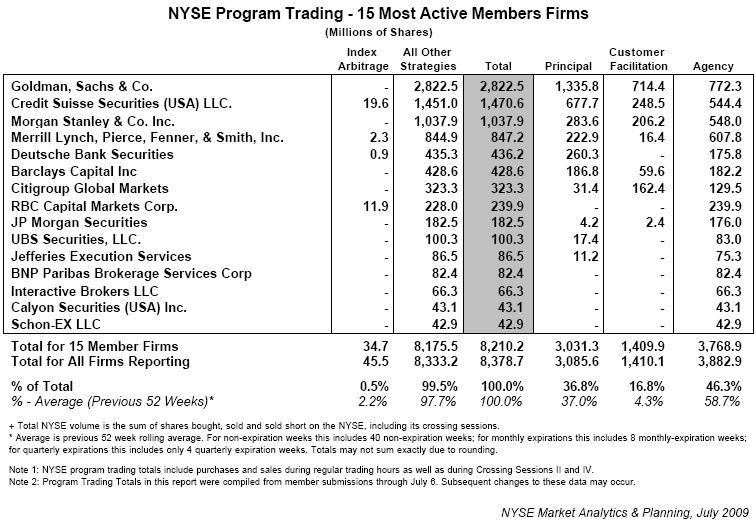 "Due to an NYSE system error, Goldman, Sachs & Co. was inadvertently omitted from the chart of most active firms, but the firm’s program activity was included in the total level of programs as a percentage of NYSE volume, which remains unchanged at 48.6 percent." Naked short sales or FTDs (failure-to-deliver) that represent about 37.5% of the volume of securities that require delivery. The galavanting SEC has now taking steps against but it is probably a too little too late. Many investors would be flabbergasted to know that the 100 shares of YYY in their brokerage account were really failure-to-deliver IOUs for 100 shares of YYY. Combined with the fake liquidity that can be instantly withdrawn if serious selling starts it will create a very unfavorable marketplace for additional potential sellers. There are many ways to value assets such as ownership of a company, real estate, etc. Some of the basics include discounted future cash flows, dividend payout ratio, price to earnings multiple, book value, etc. When assessing the health of a company I get a quick snapshot from the current ratio, acid test ratio, return on equity, free cash flow, net income and dividend payout ratio. I like dividends because when cash must be distributed it is much more difficult for management to play accounting games using the new generally accepted fair value lying standards. The payout ratio is the percentage of earnings paid to investors and is calculated by dividing yearly dividends per share by the price per share and is the opposite of the plowback ratio. Think of cash like blood and dividends like blood donations. Extremely healthy companies can donate lots of blood without hindering their operations and the investor can then deploy the cash elsewhere for a higher return. The S&P 500 is a value weighted index published since 1957 of the prices of 500 large-cap common stocks actively traded in the United States. Dividends are an important component of the total return from equities, accounting for a third of the total return of S&P 500 since 1926. The S&P 500 earnings have collapsed while dividends have declined at a slower rate. As Ian McAvity has demonstrated, the dividend to earning ratio is now above 300%. This means companies are distributing $3 of dividends for every $1 of earnings. This is accomplished by burning through cash reserves, selling off assets, borrowing, etc. This is unsustainable. One would think that only the New York Times is stupid enough to borrow money to pay dividends while gross revenue and net income decline. Likewise the current price to earnings ratio of the S&P 500 needs a reality check. When body mass is shrinking (declining gross revenue), blood is leaking (lower earnings or losses) the last thing those setting dividend policy should do is pull out another knife and cut themselves deeper to hemorrhage faster. But perhaps they are listening to the propaganda organs that neither saw the gathering economic storms nor have taken shelter from the browbeating winds and think their earnings are going to recover which will bring the ratios back into normalcy. This is no ordinary recession. Obama is intentionally exacerbating the greater depression. For the appetizer the American economy has lost over 4 million jobs. 30 June 2008 the Emergency Unemployment Compensation program began. Benefits have been extended twice. Obama may delay the first course of dinner by extending it a third time. The National Employment Law project estimates that, "Around the country, the number of people exhausting their benefits is piling up. By the end of September, more than 500,000 people will exhaust their benefits checks". The Great Depression lasted for over two decades and was not a single event. The early years were marked by lost jobs which were not replaced. As top lines evaporated they were not replaced. People and businesses began to deplete their savings before becoming destitute and getting corralled into soup lines. In the present case, job losses have been piling up like a massive train wreck. The American consumer has slightly scaled back on their purchases because they still have access to liquidity such as unemployment benefits, credit cards, 401Ks (which have become 201Ks), etc. Those sources of liquidity are drying up as credit card limits are slashed, minimum payments are raised, HELOCs are denied, retirement plans collapse and now, in September, unemployment benefits will end. The numbers on that chart are estimated to go from 50,000 to 1,500,000 by the end of the year or a 3,000% increase. The issue for the American families kicked out of their worthless homes and onto the street is becoming survivalism in the suburbs. People are not going to care about contributing to their retirement plans, buying name brands like Coca Cola, Proctor & Gamble, Wonderbread, etc. They are going to care about generic bread or Top Ramen on the table. Consequently, gross revenues for the S&P 500, which are down 10% year over year, are going to be under even more pressure. With most of the slack already trimmed earnings are going to be under even greater pressure. To bring PE ratios into historical norms stock prices are going to have to tumble. The value of real estate is a function of the earning capacity of the underlying business base. With collapsing earnings, rapidly rising unemployment and a commercial real estate market ice age the value of commercial real estate is plummeting. Originations of commercial mortgage backed securities is almost non-existent. Financing for new purchases is almost impossible to secure. Being able to find comparables for appraisals is getting increasingly difficult. Real property taxes will likewise decline putting further strain on state budgets which are in chaos like California. Many outstanding loans are non-performing and the lending banks are failing. From the 6th to the 27th of July another 12 banks have failed. In January 2008 I warned that the FDIC was preparing for massive bank failures. Lately I have warned about how the annual worldwide platinum production is valued at about $7.8B compared to the FDIC’s $12B of reserves to cover$4,831B of insured deposits. The monetary metals are one way to protect yourself from the risk of massive bank failures and a potential bank holiday. Chris Powell of the Gold Anti-Trust Action Committee has observed that "There are no markets anymore, just interventions." Where would the manipulators get the massive amounts of capital needed? Perhaps Donald Rumsfeld knows. The United States Constitution provided safeguards against these types of problems. This is one reason the barbarous relic known as the Federal Reserve should be razed. The unfair and immoral monetary system is complete opposition to a Constitutional monetary system. These interventions of manipulating both the supply and cost of currency are failing as is the Federal Reserve's attempt at quantitative easing. During The Great Credit Contraction capital will seek the safest and most liquid assets. At all times and in all circumstances gold remains money. Because of the large aboveground stockpiles gold is the world's primary monetary commodity. Likewise silver and platinum are also risk-free commodity currencies. Two weeks ago I recommending buying platinum which has since risen $80 per ounce or about 9%. I also recently suggested buying silver around FRN$12.50 which is now over $14 or about a 12% gain. I have found GoldMoney to be the best alternative to the current failing worldwide monetary system. I recently sold a few copies of The Great Credit Contraction for platinum. A Swedish buyer remarked, "I have now made my first payment in platinum ;-) ... I think we may have seen a glimpse of the future. ... (And as a gold-bug I think it can be good.) Thanks a Lot!" Many people may take for granted the liquidity of the financial markets, banking system and other grease for the wheels of commerce. How would your investments be affected if the financial markets closed for 1-2 years? How would your business be impacted if there was a bank holiday for an undetermined period of time? Having an alternative system, completely independent on the current failing structure, in place and operational is good business sense. Eventually the Information Age alternative to the barbarous relics of central banks and fractional reserve banking become complete substitutes because of the lower costs, ease of use, lower risk and other superior attributes. As the liquidity of the monetary metals increases through their use in ordinary daily transactions, like being used to purchase books, their value will rise. Additionally, gold's technicals are looking extremely strong. The 200dma at $880 while the current price is about $955 or 1.08x. The 18 month consolidation above $900 has laid a very strong foundation for the next upleg. The reverse head and shoulders pattern is extremly bullish. Seasonally gold is weak during the summer and strong during the fall but lately it has been trading like power currency. While massive short positions are being taken by commercials gold will likely easily breach and maintain $1,000 ounce this fall. With unemployment skyrocketing, bailout fever in Washington, earnings declining the FRN$ is going to be under tremendous pressure from ballooning budget deficits which will have to be monetized. All of this is positive for the ancient metal of kings. The Great Credit Contraction, an economic climate change from an inflationary summer to a deflationary ice age, has barely begun. The remaining liquidity in the market is largely illusory. Residential real estate, commercial real estate, the major stock markets and even the banks are almost all zombie institutions anchored to fraudulent financial statements that are preventing the needed healing liquidation. The unemployment situation is escalating out of control and The Greater Depression is wearing on people and psychology is being changed. Earnings are collapsing and dividend to earning payout ratios are unsustainable. Meanwhile the monetary metals appear poised for a significant rise as the FRN$ continues evaporating. Because there is no intelligible answer for what is a dollar therefore it is an unreliable instrument for performing mental calculations of value. This next crash which appears imminent but could take a while to materialize because of manipulations will likely see the DOW fall from its current 9.5 ounces to about 5 ounces of gold and the S&P 500 sliding from its current 1.3 ounces of gold to about 0.85 ounces. Additionally, the really good buying opportunities will be enjoyed by those who can settle transactions because their assets are liquid, like with gold coins in a safe or a reputable third-party like GoldMoney, and not frozen in some closed market or holidaying bank. If you want real cash, not illusions like the FRN$, Euro, Yen, Pound, etc. which can evaporate in hyperinflation, then you better learn how to buy gold because it is the safest and most liquid asset. With gold you will always be able to buy something. Disclosures: Long physical gold, silver and platinum with no positions in the problematic GLD or SLV ETFs, S&P 500, DOW, NYT, GS, Berkshire Hathaway, Coca Cola, Proctor & Gamble, Bank of America or Citigroup.